Aintree racecourse is a track near Aintree, Liverpool in the UK. It’s most famous for hosting the Grand National, the most highly anticipated and watched steeplechase race in the UK racing calendar. The Aintree course is certainly not the most straightforward there is. Fences such as the Chair, Becher’s Brook and the Canal Turn have gained prominence and indeed notoriety due to the role they have played in the Grand National over the years. The Grand National isn’t the only race to utilise these fences, as they also feature in Fox Hunters Chase and Topham Chase, which are races that are part of the wider Grand National Meeting. The fences also feature in the Grand Sefton Handicap Chase and Becher Chase in Aintree’s December Meeting. 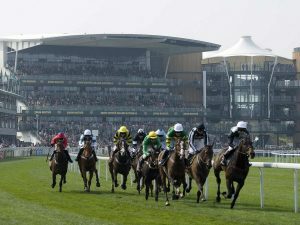 The Grand National held at Aintree is run over a distance of 4 miles 514 yards. The race typically starts with a field of around 40, though frequently a great many less finish the race, due to falls and horses pulling up over the two laps of the course. Aside from the showpiece Grand National Meeting, and aforementioned December meeting, one other stand out race at Aintree is October’s Old Roan Chase. It’s a grade two national hunt steeplechase race which was won by Kauto Star in 2006, just two years after the event was first held.